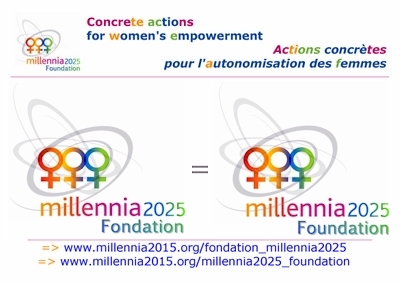 Developed since 2008, the widely visited website of the Millennia2025 Women and Innovation Foundation counts more than 3.000 pages, in French and in English: it présents the whole Foresight research process of Millennia2015 "An action plan for women's empowerment and gender equality" and the concrete actions it is producing. Its Knowledge Database proposes links to international publications related to Millennia2025 Keywords. Welcome! Register as Member of the Millennia2025 International Voluntary Researchers' Network: welcome! Les musiciens de Adrénaline Superclub nous offrent "Il n'existe que des dames" : écoutez, c'est beau !